It is funny how some of the family favorites never make it to the blog!I have been making drumstick leaves sambar for so long and so often but until now, I never had the thought to post this simple sambar on the blog!!! But I am happy that at least now I remembered to click and post here since drumstick greens is the chosen ingredient for Week 3 of the Mega Blogging Marathon #68 themed Cooking Carnival ,where I am doing dishes with one ingredient a week. This dish joins the list complied for recipes with drumstick leaves and I still have a few more recipe to add to the collection. When kids are not so fond of eating greens when presented as a curry, the next best option is to drown the leaves in sambar!! It goes in so easily and they never really notice which type of greens is swimming in the dal!! Heat oil in a pressure cooker and add the mustard, channa dal, urad dal, fenugreek seeds. 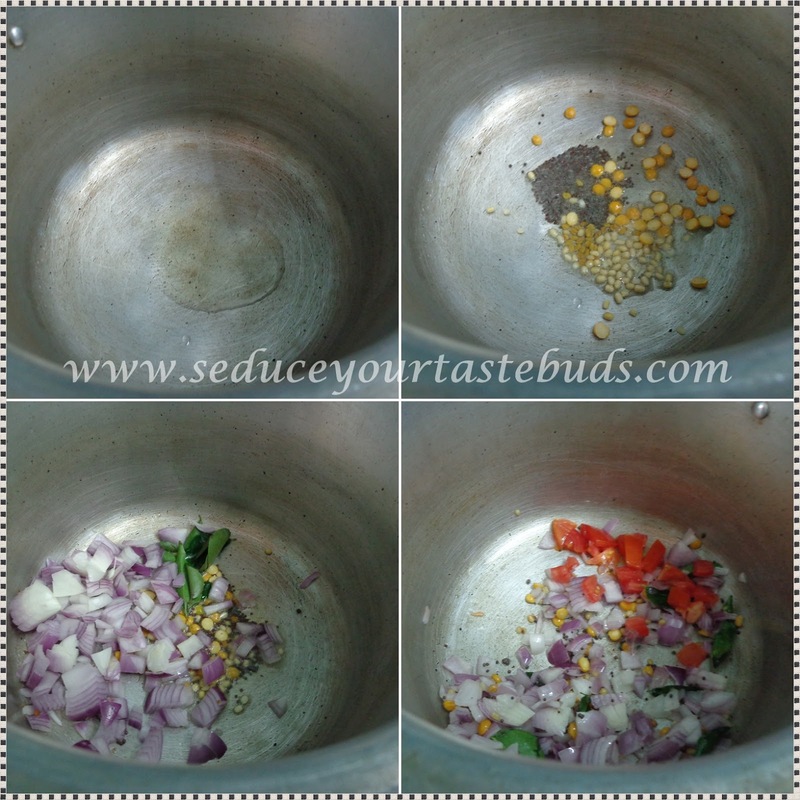 Once the mustard pops and dal turns brown, add the onion and curry leaves and saute till the onion is translucent. Now add the tomato and saute for a minute. Put in the drumstick greens and add 2 cups of water and bring to boil. Add the turmeric powder ,washed and drained dal, sambar powder. Put in salt and tamarind extract. Adjust to taste as we just need a hint of the sourness not more than that.Pressure cook for 10 minutes till teh dal is done. Open the cooker once the pressure releases and transfer onto a serving dish. Use tender drumstick leaves. Mature ones take longer to cook and is a bit difficult to digest as well. You can also cook this in a pan but it will take longer for the dal to get done. Also you can pressure cook the dal and then season and continue the process in a pan. I use home made sambar powder and it is not very spicy. So I add 2 teaspoons.IF the sambar powder you use is spicy, adjust to suit your taste. Adjust the quantity of water depending on the consistency of sambar you prefer. This is one of our favourite sambar, i do this often even with dried drumstick leaves i carried all the way from India. This is a nice way to sneak in the greens. Sambar looks delicious!! I haven't tried cooking with this greens ever even though they are locally available to me. The sambar sounds yummy and comforting like any greens' based one. Even my kiddo don't think much about the greens in sambar or dal, as she assumes it to be coriander leaves. So I always sneak in green in sambar. This one is one of my fav. Love the different ways of including drumstick leaves.. flavorful sambar. I must get some of these leaves to try your different recipes..sambar looks very interesting. I miss this Sambar a lot,since we get drumstick leaves rarely here,I never had a chance to make this Sambar.Such a flavorful and comforting Sambar.. 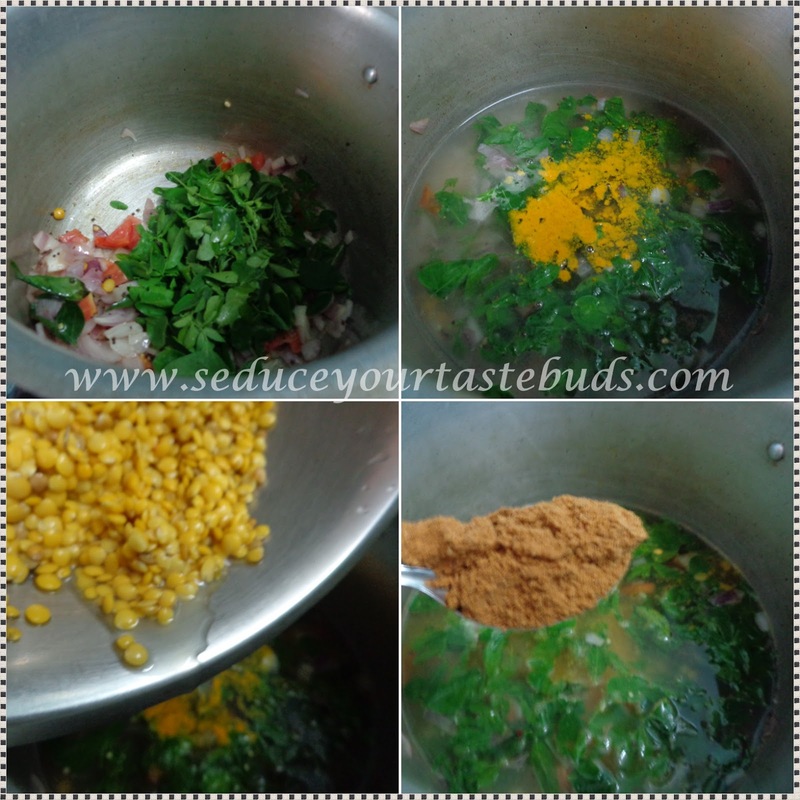 Such a flavorful way to add drumstick leaves to a meal. Awesome!! Yum what a delicious sambhar. I think I better plan a drumstick tree. 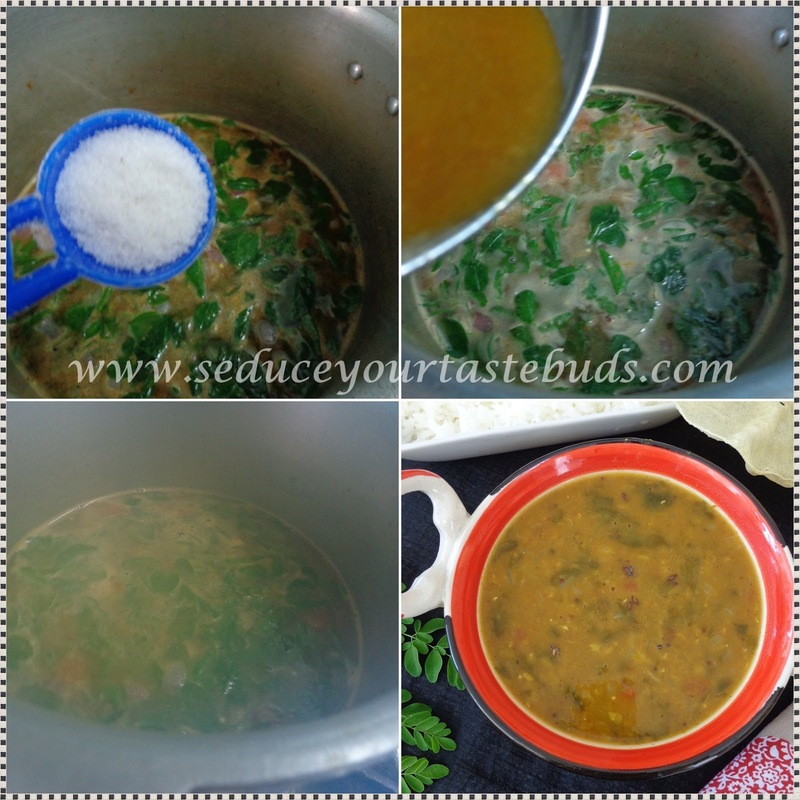 Love this nutritious sambar made with drumstick leaves. Never used these leaves .Sambhar looks delicious.